I spent a chunk of last night and this morning playing a few ranked matches. Prior to doing so, I took some of the advice that people gave in the comments and tried out the jungling mechanics a bit in custom games. It took me a bit to find a jungler that didn’t feel awkward as hell to me, and I’m still not good at it - it’ll take a while until I learn the optimal order of the camps, the ideal times to gank, etc. But it’s progress! Despite still not being able to jungle well, I jumped into my first ranked queue. My thought was to try to call either top or support, as those were the two positions that I’m most comfortable in; as I was typing it, though, both of them got called. So did adc and jungler, leaving me... mid lane. A bit of a flashback, here. After my awkward introduction to League, and a lot of learning games, I spent time looking through all the champions, trying to see which ones I thought appealed to me. I looked at their moves, their stats, and... their appearance. Yes, I know appearance doesn’t matter. I still used it as a criteria. >.> One champion in particular caught my eye... a certain card-throwing guy named Twisted Fate. As soon as I saved up the IP, I bought him... and it all somehow clicked for me at that point. It was really easy for me to learn him, and things improved dramatically... and then people stuck me in mid lane with him. Mid lane was a whole new beast to me - not only did I have to contend with the enemy champion, but I also had to be wary of another person coming in from either side of me, and I was also supposed to keep on eye on the whole team and communicate pertinent information. It was a lot to handle. I did okay with it, I suppose, but I didn’t excel (likely in large part to my still being so new). I didn’t come to hate mid lane, but part of me came to fear it. So, in my first-ever ranked game, I got assigned mid. As stated in the previous article, I don’t purchase RP for the sake of buying champions, so while I have a fair number of them, I’m nowhere near the entire roster. My choices seemed limited, especially when taking into consideration who I was up against (a Veigar). Finally, I settled on Lux, and then it was time to teleport into the Rift. As I stared at the champions, I panicked a bit. Why had I picked Lux? I’m not as familiar with her as I am other champions - and the fact that I was an AP champion would only help Veigar nuke me with his ult. I felt dumb for my choice. Then I realized that thinking this way was only going to make me play worse, and I did what I could to snap myself out of it. The beginning of the game was fairly slow. It wasn’t until 6 minutes in that I was involved in my first real encounter - the jungling Voli came at me, flashed past my Q, and proceeded to eat me alive. I took some solace in the knowledge that his flash had been burned for me. At 8:30, I died again - but this time it was solely my fault. 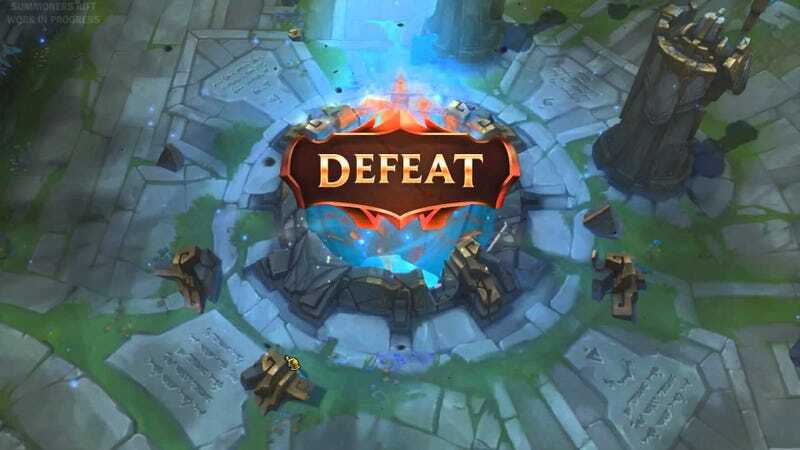 Morgana had wandered up and hit me with her Q, and I was low on health, but alive... but then I wandered away from my tower to kill some minions, and Veigar took me down. I berated myself and waited for my teammates to do the same. Nothing. No anger, no people telling me how much I sucked, just Warwick coming to cover my lane. The rest of the game seemed to blur by. I recovered and ended the game 1/2/11, but the real story is the team scores. My team went 26/6/39, the enemy team went 6/26/7. This was a prime example of a good team holding me up (but I helped in team fights, I promise! ), but the bigger story was that I felt like there was an immense weight off my shoulders. I’d successfully played my first ranked game! My confidence skyrocketed, and I thought “Yeah, I can do this!”. I eagerly jumped back into queue. My teams lost the next three games, two of them badly. G2: Blitzcrank (support). Our team: 52/53/71. Enemy team: 53/53/95. This was a super close game, and we probably could have won it, but it just didn’t go our way. Our ADC was an Ezreal who... well, he didn’t do very well. It was really frustrating. G4: Ashe (ADC). Our team: 4/24/2. Enemy team: 24/4/20. My team surrendered at 20:24; I was the only one who voted no (because I hate surrendering). Two toxic team members and a lack of communication put us in the whole; apparently the enemy team was ranked decently, as well. I called it a night after this game. I spent a lot of time trying to figure out what was going wrong, and why my team was constantly losing. I came to the conclusion that there really wasn’t one reason in particular - sure, I could try to blame teammates, or come up with other excuses, but in reality, a lot of the time, we just got outplayed. That’s all there is to it. I’m glad to say that I didn’t wrack my brain over it for too long. This morning, I cautiously jumped back in, intending to play top - but someone beat me to it, and I ended up supporting again. One factor that I realized at this point was that it seemed like the more the team talked prior to the game, the better we did. We had a fair bit of friendly chatter, and in the game itself, we were supportive of each other. We didn’t jump down people’s throats when they died or messed up. It was fun. And we won, and I think that the environment was a huge part of it. G5: Blitzcrank (support). Our team: 41/15/39. Their team: 15/41/18. My ADC actually friended me after the game and invited me to another one (but apparently their room filled up before I could join). So for now, I’m 2/3. Five more games until I get my ranking, and what have I learned so far? One of the little blurbs that comes up on the loading screen talks about how communication leads to a higher win percentage. Another talks about how people who rage and curse at teammates lose more. I typically read those and scoff at them, but I think I’m believing it a bit more, now. I’ve only played five games, so obviously I don’t have a large range of data to base it off of, but it’s held true, for the most part. I’m going to do my best to get top lane in one of these games, and I’m going to keep practicing jungling. A lot of people left comments about playing together, and I’m happy to add pretty much anyone who’d like to - but there are so many comments that I know I’d miss a few if I tried to find them all. So if you want to add me, just send the request to Janusaurus and I’ll get to it ASAP.